While on a recent project I needed to build a variation of the DAX date table. In my previous post, found here Creating DAX Date Tables I was built a date table for every day of the month for multiple years. 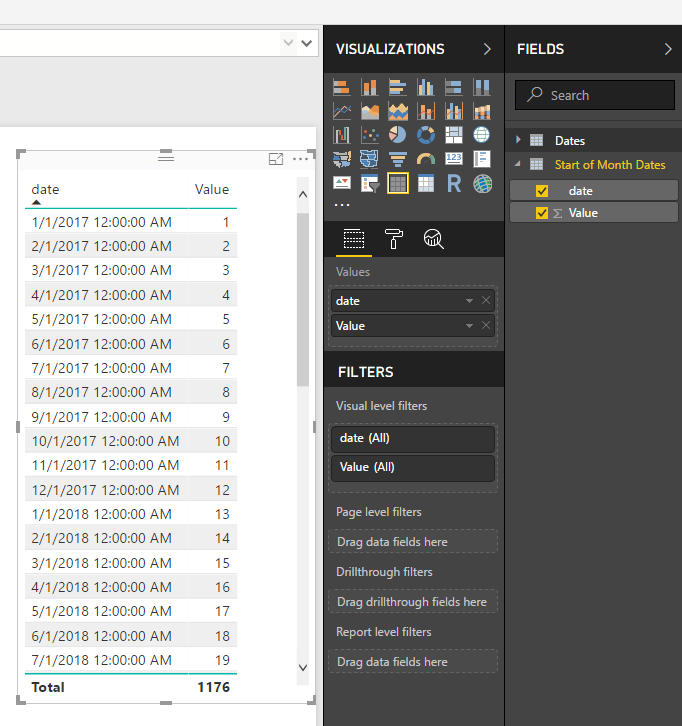 I’ve only ever needed to consume a fully populated date calendar, but in this instance because the data I was collecting was already aggregated to the first of the month I only needed a date calendar with each month’s start date. After some playing around with my previous DAX functions I think I was able to come up with an elegant solution. Let’s begin by making a basic table. 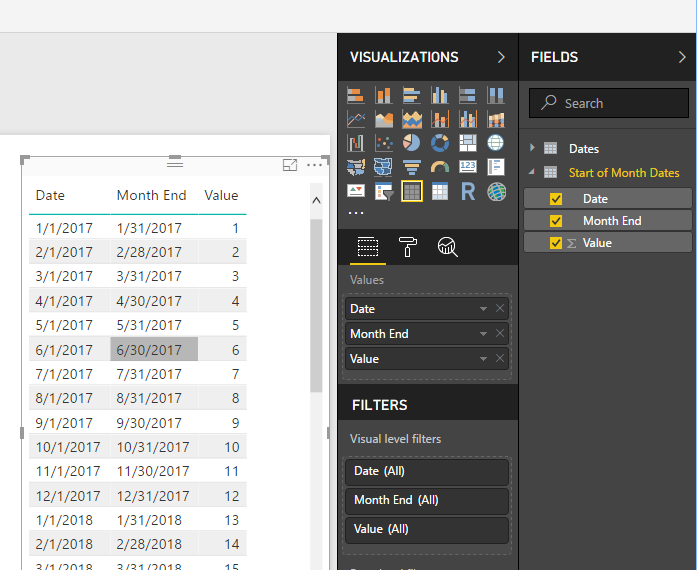 Open Power BI Desktop, on the Modeling ribbon click New Table. This will produce our standard table from January 1st to December 31st, 2017 with every day populated in between. In, addition we get numerical values for Day, Month and Year. Note: This table is producing a list of dates using the Calendar DAX function then iterating row by row to calculate each numerical value for the Day, Month and Year. Add the Table visual with the following Values from our created DAX table. 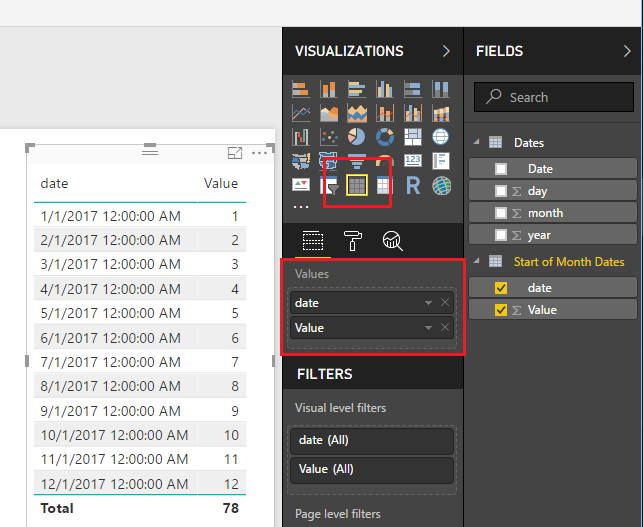 Note: When you drag over the field labeled Date the field will be naturally added as a Date Hierarchy. To remove the Date Hierarchy, you have to click the little drop down arrow next to the word DATE and select the word Date in the drop down menu. This will remove the Year, Quarter, Month and Day date context from the visual. The date calendar we made has every date, but we want only the first of each month. Note: I already removed the Date Hierarchy using the instructions listed above in the previous note. 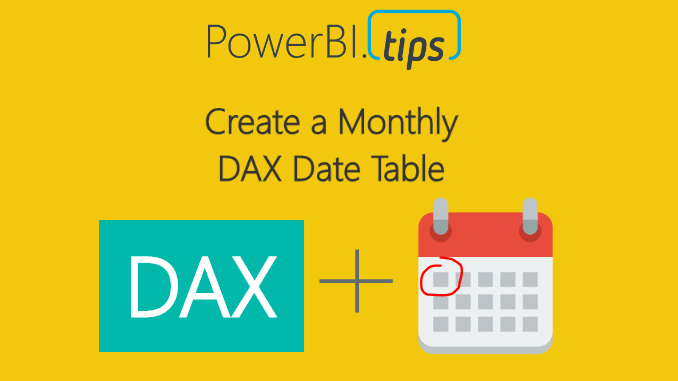 This new DAX Date table is first generating a list of numbers 1 to 12 one for each month. Then it iterates through the list and produces a date using the Date function were we manually provide the Year, and the day. You can see the Generate function produces a column of data called [Value]. The variable denoted by VAR inc is capturing the number for each month. So, now what if we want to produce more than one year of dates? Super simple, just change the generate series from 1 to 12 to 1 to 48. This will produce three years of dates. With one number change we can produce 4 years of dates. We have added a new column to note the end of each month. Well, thanks for following along. In my use case this start of month date table was exactly what I needed. I thought this was a handy little DAX table, and I hope you have found this helpful as well. Be sure to share this post if you found this helpful. 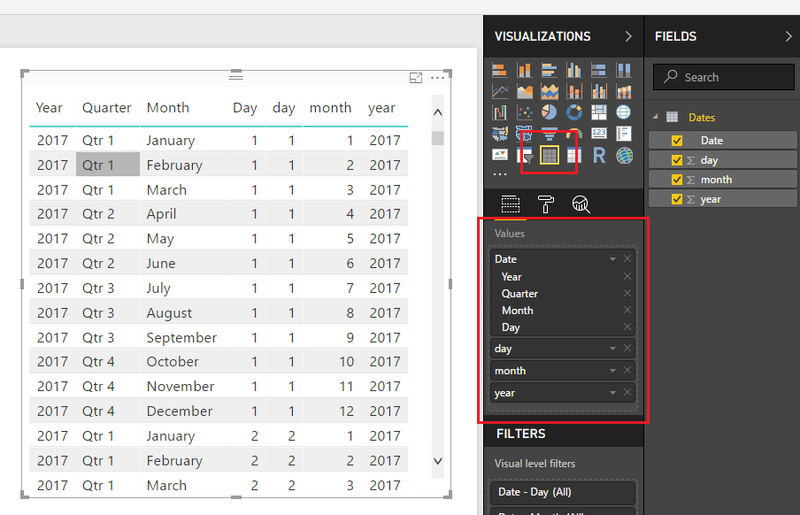 Good post, Could we use the generated table with “start of the month” as a calendar table? as the calendar table has to have a continuous range of dates. Thanks a lot. You are awesome!